Most of us who carry firearms for self-defense are extremely conscientious about how and where we carry our guns in public. But what we do with them when we are not carrying is equally important. 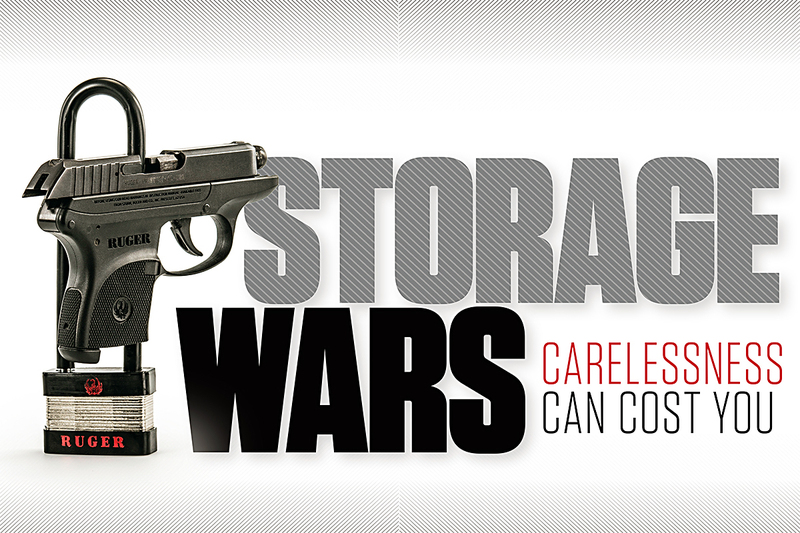 Whether in our homes or in our cars, we need to carefully consider how we store our guns. First, be sure to check the laws on home and vehicle storage in your state (and any state you visit). They are often vague and open to dangerously broad interpretation. Some “safe storage” laws can even make you subject to criminal prosecution or a civil lawsuit for crimes committed by a thief who stole your guns. As always, ask your attorney for recommendations. You do have an attorney, don’t you? When it comes to home storage, we suggest you consider several factors. What is the physical layout of your residence? Do you live in an apartment or condominium, a townhouse, or a single family home? Is a gun safe an option? Are Children or Teens Present? Next, consider your living situation. A retired couple with no children has less to worry about than young marrieds with toddlers or teenagers. And an unmarried 20-something with several roommates may have different issues to consider. A perfect example is the horrible case of the graduate students who had a party during which a drunk guest walked into a bedroom, found a loaded gun on the nightstand, picked it up, pointed it at another guest (who was passed out on one of the beds), and pulled the trigger. Now, setting aside for a moment the stupidity of the shooter, what sane person has a beer-bash and leaves guns lying around? If you have very young children and you want to have your firearm readily available for self-defense in the middle of the night, you can check out any of the gun vaults designed just for that purpose. They allow quick access by you, but not a 4-year-old who might wander into your bedroom at 2 a.m. Good ones aren’t cheap, but what is your child’s life worth? In Arizona, a man was fatally shot by his 4-year-old son. Ironically, the dad was an Iraq military veteran. The circumstances were not complicated. The man and his son were visiting friends, and apparently someone left a loaded handgun where the boy could easily find it. He picked it up, pointed it, and pulled the trigger. After a single gunshot wound to the chest, the father was pronounced dead at a local hospital. In my home state of Minnesota, another 4-year-old shot and killed his 2-year-old brother. What is particularly disturbing about this incident is that it appears at least half a dozen loaded handguns had been left lying around in plain sight, easily within reach of the child. In Kentucky, a 5-year-old shot his 2-year-old sister. According to the story, “Stephanie Sparks paid little attention as her 5-year-old son, Kristian, played with the rifle he was given last year. Then, as she stepped onto the front porch while cleaning the kitchen, ‘she heard the gun go off,’ a coroner said.” You’re probably asking yourself, who walks out of a room, even for a moment, leaving a 5-year-old “playing” with a real gun? Answer: someone who will regret it forever. In each of these cases, adults who should have known better were egregiously derelict in their duties to protect their young children. Even a few seconds of inattention can lead to a lifetime of regret. The emotional trauma is simply unimaginable. In the case of married couples, divorce is highly likely, often within a year. Think about it. If you are the one who facilitated, however unintentionally, the death of your child, your partner can no longer look at your face without remembering what you did. It is simply too painful. And if the adults involved will suffer with the consequences of their actions, imagine what the children in these cases are going to face, especially when they reach the age where they fully comprehend what they have done. In the above cases, the children were all barely more than toddlers, but teenagers are often no better. Even those who have been properly trained in firearm safety can do incredibly stupid and dangerous things, especially when they have their friends around and no adults are present. So be absolutely certain that when no responsible adult is home, your guns are in a condition that prevents any unauthorized access. Remember that if your actions are found to be legally negligent, you can face both criminal prosecution and/or a civil lawsuit, especially when children are involved. Also, consider how many outsiders have access to your residence, especially when you are not home. Do you leave a spare key with a neighbor? Sure, you trust the neighbor, but does the neighbor have a teenager? I recall just such a case that occurred in Chicago back when I lived there. A next-door neighbor had been given a spare garage door opener by the gun owner in case he got locked out. The neighbor just happened to have a teenage son. Now, the son was a genuinely nice kid, but, as often happens, he had friends who weren’t so trustworthy. After describing the “awesome gun collection” in the house next door, his friends prodded him to show them. Since no adults were home in either house (the gun owner and his family were on vacation), the son agreed. Unfortunately, while everyone else was admiring the guns in the cabinet, one of the boys slipped away and secretly unlocked the sliding glass door. Later, the larcenous “friend” came back, broke in, and stole several guns and other valuables. Realizing what must have happened, the neighbor’s son at first said nothing about his unauthorized “tour” of the house. But eventually the thief was caught and prosecuted, and the truth did come out. As a result, the son was indicted as an accessory, and a lengthy and ugly civil lawsuit resulted. The neighbors did not remain friends. Storage in a vehicle presents unique risks, even more so if your travels will place you in a state that does not recognize your carry permit/license. It is vital that you understand the local rules for transporting firearms. This is often complicated by the range of vehicles we have today. An unloaded, cased firearm in the trunk of a normal sedan is likely to be considered legal in most states. But SUVs and pickup trucks present more significant challenges. And while many states do not require permit holders to unload their guns before storing them in a vehicle, never leave your weapon (even for a brief visit to a “no-guns” venue) in the glove box or console—these are the first places “smash-and-grab” thieves look. If no trunk or lockable compartment is available (as in many pick-ups), use a lockable steel case cable-locked to the frame of the seat. And remember to lock your car, too! Every year across the country, guns are stolen from vehicles, an astonishing number of which were left unlocked. Be smart. Be safe. The RV presents yet another challenge in that there is widespread legal disagreement as to whether it is a vehicle or a residence. This is important because where your firearm may reside can depend on whether the RV is moving or not. Some states specify that while moving, it is a vehicle, but while parked it is akin to a motel. Others consider it a “domicile” only if parked in a “designated RV facility” (hint: the parking lot of a Walmart may not qualify). Find out. As an extra precaution when I travel, I print out both the official government carry and “transportation of firearms” rules and keep them in a file folder in my car. If you are stopped, it will at least show due diligence on your part. Also, be very wary of travel to or through states like Illinois, New York, and California that are incredibly hostile to guns and gun owners. Horror stories abound of visitors imprisoned for violating some obscure rule. A particularly frightening case happened one New Year’s Eve when a Florida man and his family were stopped in Maryland. Simply because of the way his wife answered his questions, the officer called for backup and for 90 minutes, multiple officers “tossed” the SUV, frisked everyone, and badgered them with accusations even though there were no guns in the vehicle. They were finally released, and officials later apologized, but the damage had been done. The incident should serve as a warning to the rest of us, because whether at home or on the road, it will occasionally be necessary to store our firearms. It is therefore imperative that we do everything possible to protect ourselves and our families, both physically and legally. Previous post: Turkey Hunting: What’s In Your Pack? I keep most of my rifles and firearms unloaded, but I always have a few in reach when I am at home that are either loaded or have the chamber empty but have a loaded magazine. Be cautious with your firearms and teach your children how to respect guns and safety. Telling children: “Do not ever touch my guns,” is not sufficient. Recently my sixteen year old son and I attended a professional two day rifle marksman course. We shot from 15 to 200 yards and most importantly they taught my son how to handle the gun safely. The Hornady RFID vehicle gun safes and vaults are very good product to provide both quick access and protection of your guns at a reasonable price and have both long guns and pistol options. I have both in my suv. The pistol option for my P320 is within arms length while I am driving. I have the rfid activator on my phone case. I also keep my ARX100 in the suv vault that uses the same rfid activator on my phone.